Valiant Entertainment is proud to announce that it has reached an exclusive digital comics distribution agreement with comiXology, the world's largest digital comics platform available on iPhone, iPad, Android, Kindle Fire and the Web with over 60 million comic and graphic novel downloads to date. 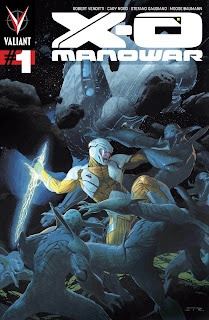 Beginning today with the release of the all-new X-O Manowar #1 by New York Times best-selling author Robert Venditti (The Surrogates) and Eisner Award-winning artist Cary Nord (Conan), comiXology will offer same-day as print digital releases for all of Valiant's upcoming titles. Additionally, Valiant's expansive back catalog of classic content will also be exclusively available via comiXology. "There's tremendous excitement around Valiant's return, and they're bringing with them one of the greatest libraries of characters and stories in comics," said comiXology CEO and co-Founder David Steinberger. "We couldn't be more proud to partner with Valiant in the digital marketplace. We’re sure to see the original Valiant fans energized by making these great comics available across the globe, while also bringing in a whole new generation of readers." "For the first time, through comiXology's platform, Valiant Comics will be available anywhere in the world," said Valiant CEO Jason Kothari. "With Valiant's return now in full effect with today's release of X-O Manowar #1, the timing couldn't be better to remind people once again of the incredible characters and stories that made Valiant a household name." In the meantime, today fans everywhere can now add all-new Valiant material to their digital comics libraries with X-O Manowar #1, from writer Robert Venditti and artist Cary Nord, available now on the Comics by comiXology platform — available on iPhone, iPad, Android, Kindle Fire and the Web.